Wooden boat ramps have been built along the St Lunaire-Griquet harbour in Newfoundland, Canada so that the locals of this town can pull their boats out of the water. In the backdrop, fishing stages sit along the water's edge and above, building and houses perch atop the bank. 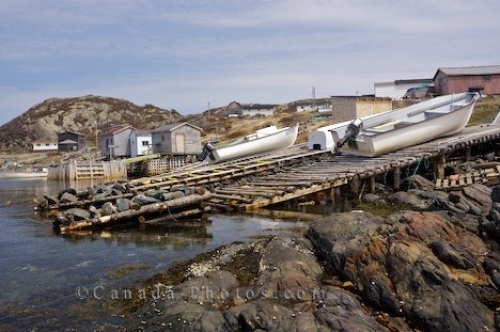 Picture of boat ramps where boats are pulled out of the water daily in the harbour of St Lunaire-Griquet in Newfoundland.